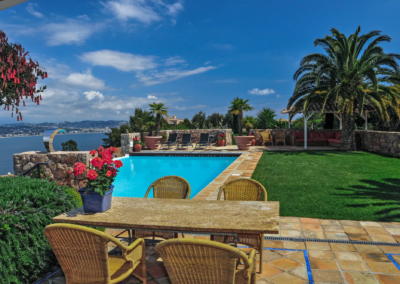 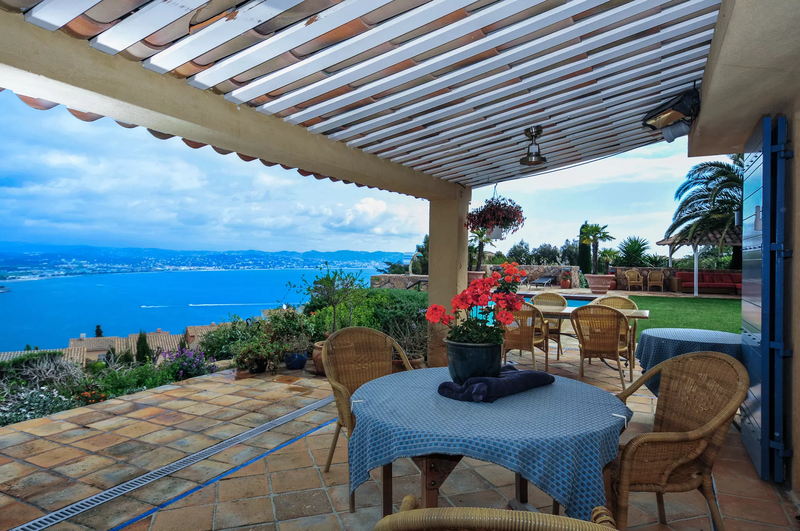 Built at the top of the hills above the port of Théoule-sur-Mer, this stunning villa enjoys dramatic 180 degree views over the bay of Cannes and the Isles de Lerins, where an array of white sailing boats and yachts stand out against the intense blue colour of the sea. 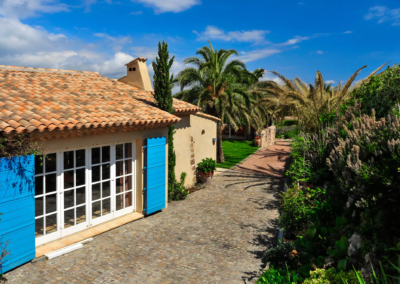 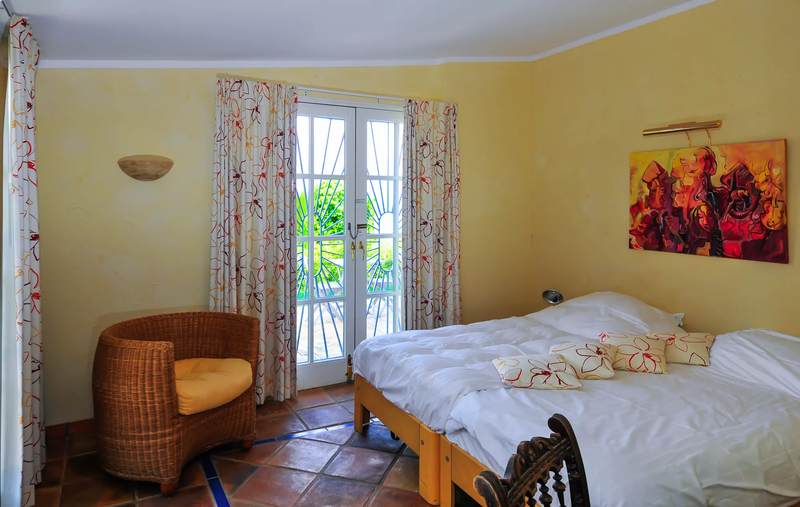 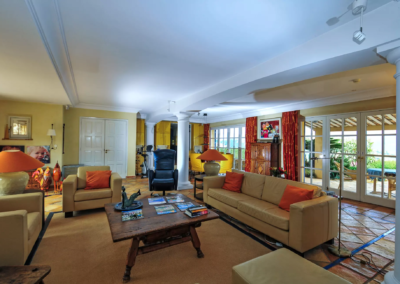 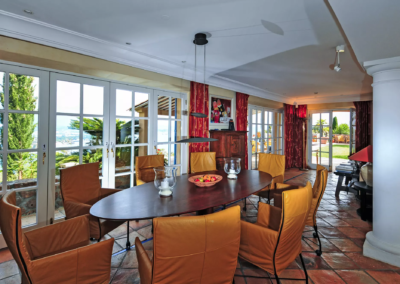 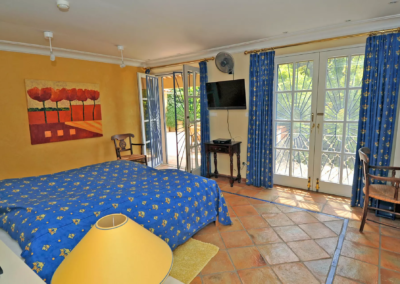 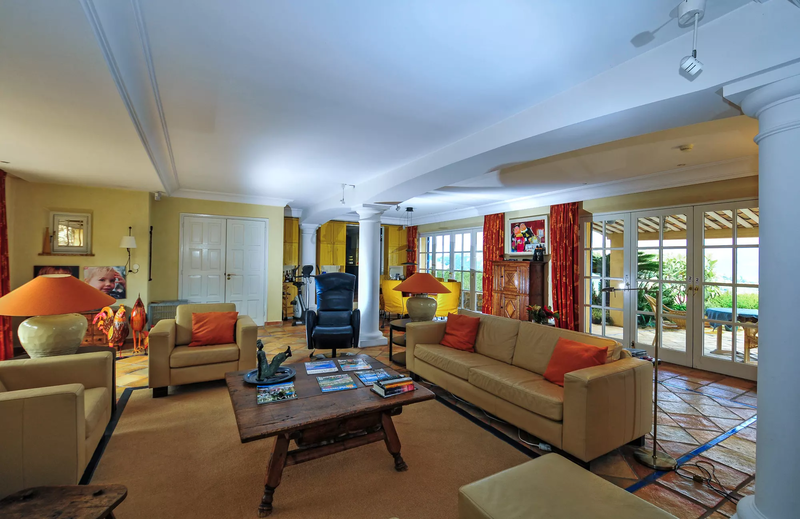 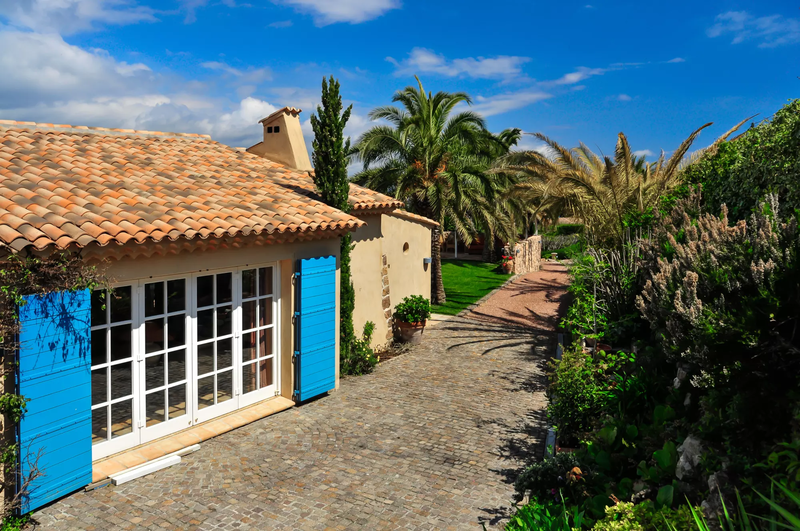 This Theoule sur Mer luxury vacation villa has been completely refurbished to the highest standards and features an ample open plan living area, where the modern look of the furniture and soft furnishings blend seamlessly with the more traditional style of the other rooms. 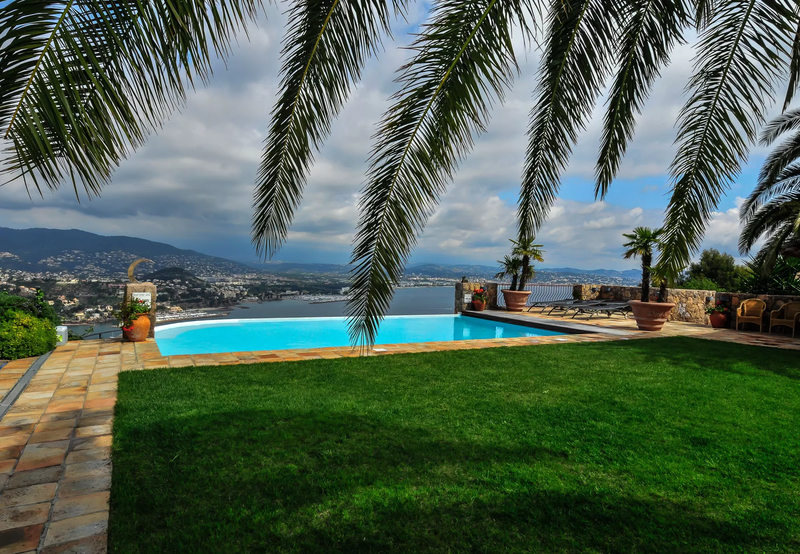 Relax in the stunning infinity pool which appears to merge with the sea beyond, or indulge in an evening cocktail on the terrace enjoying unforgettable sunsets. 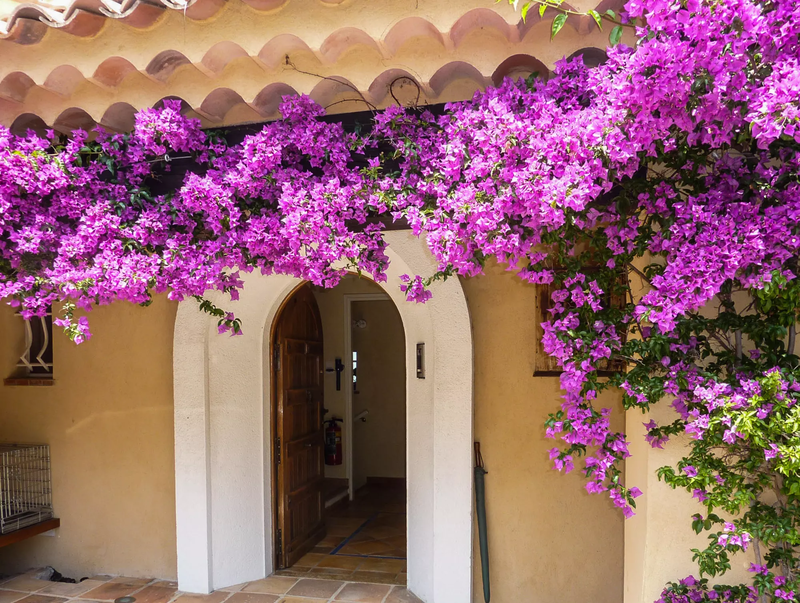 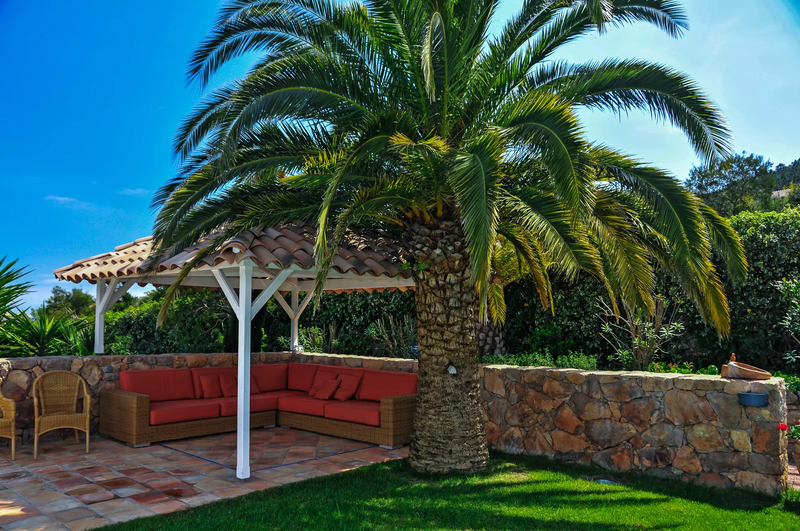 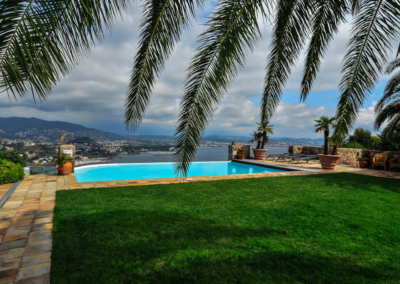 Colourful bouganvilleas and roses adorn the walls of this villa while tall cypresses, palm trees, fruit and olive trees provide the large terraced garden with plenty of shaded areas. 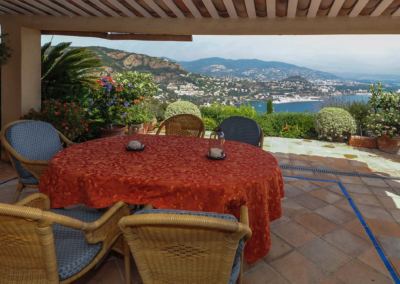 The distinctive red rocks of the Esterel mountains are just behind L’Hippocampe, offering many exciting hiking trails and dramatic view points along the coastline from Mandelieu to St Raphael. 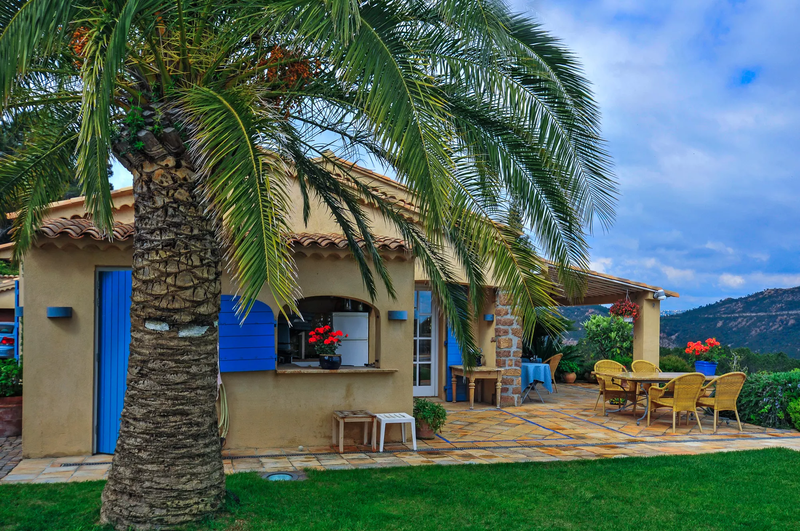 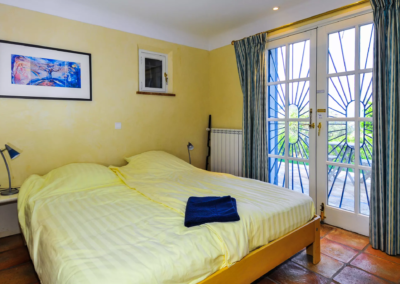 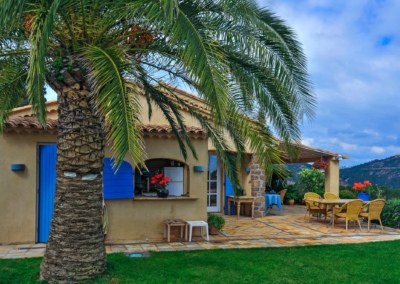 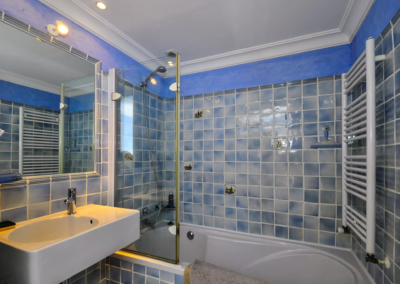 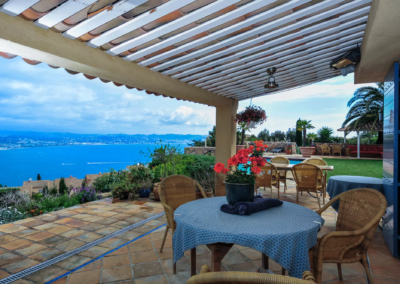 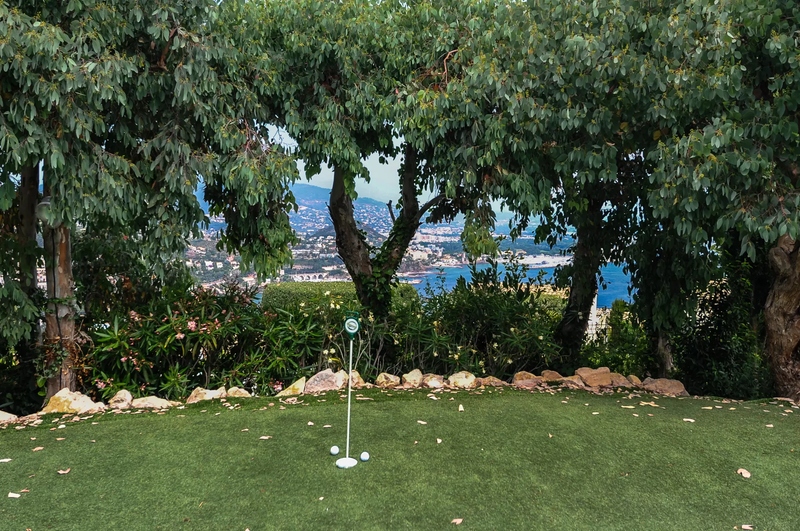 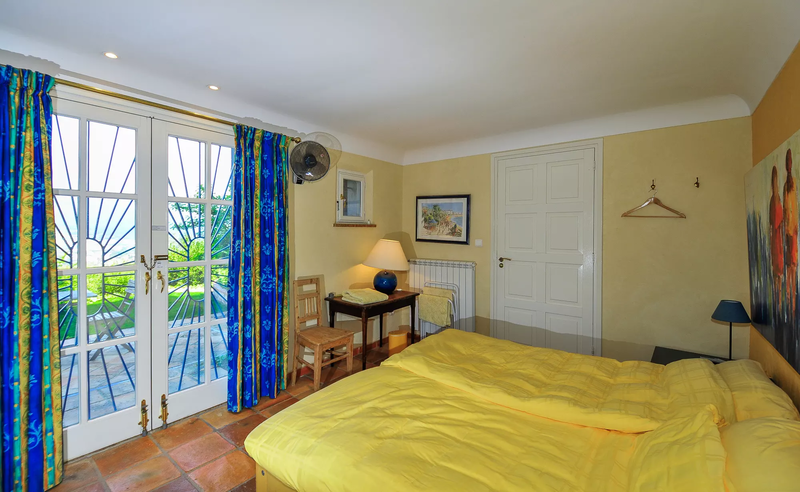 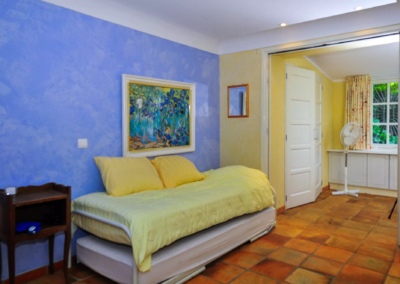 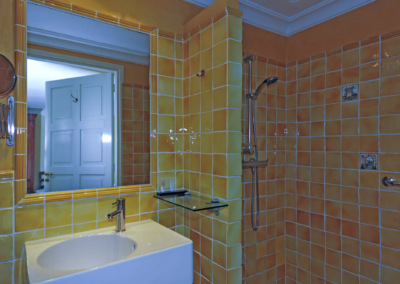 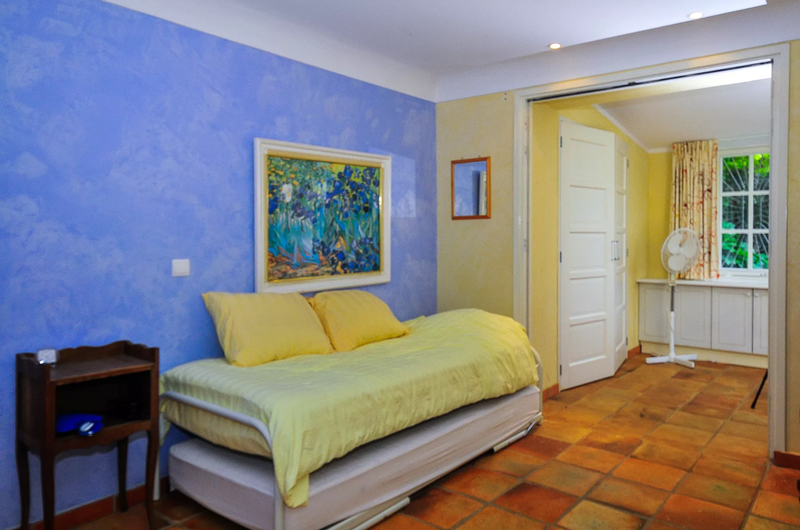 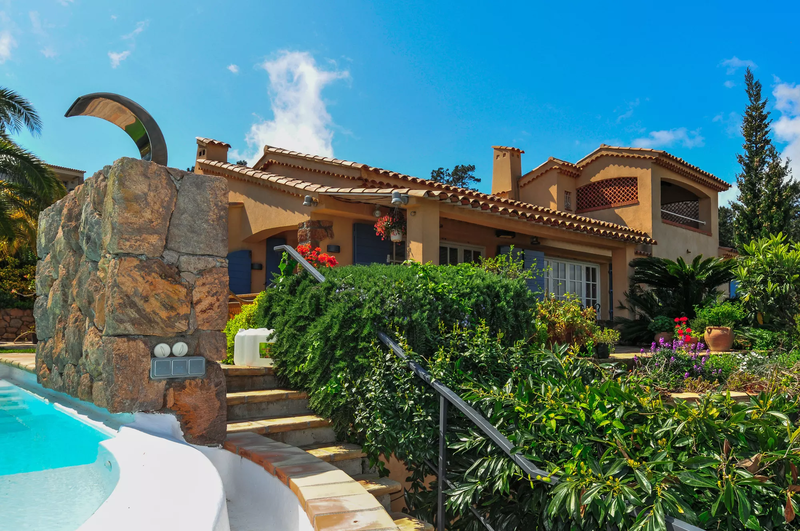 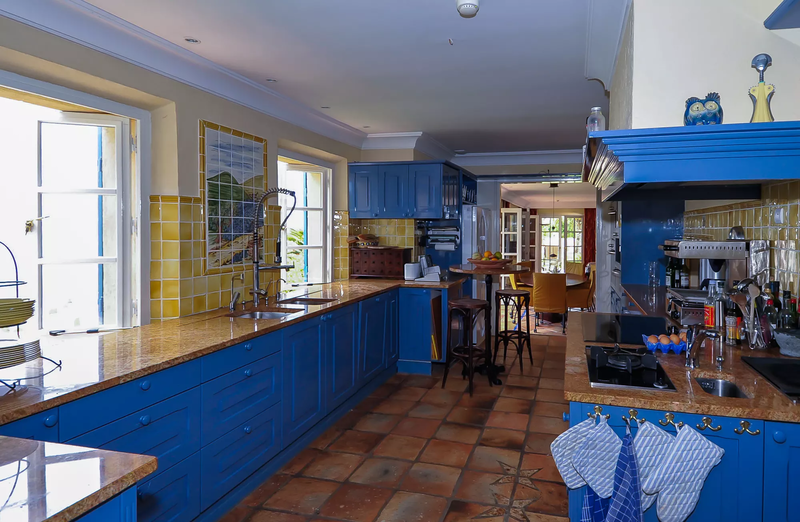 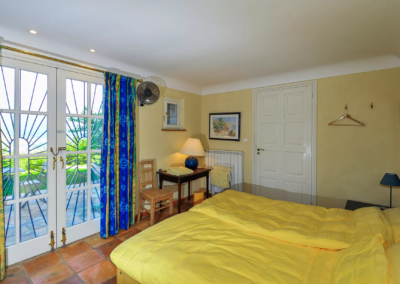 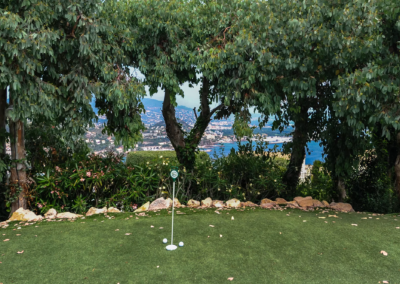 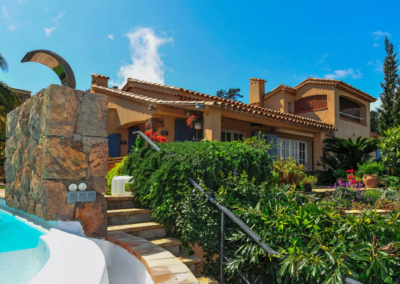 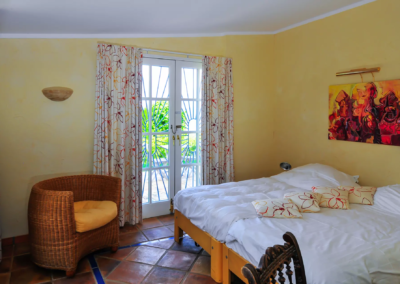 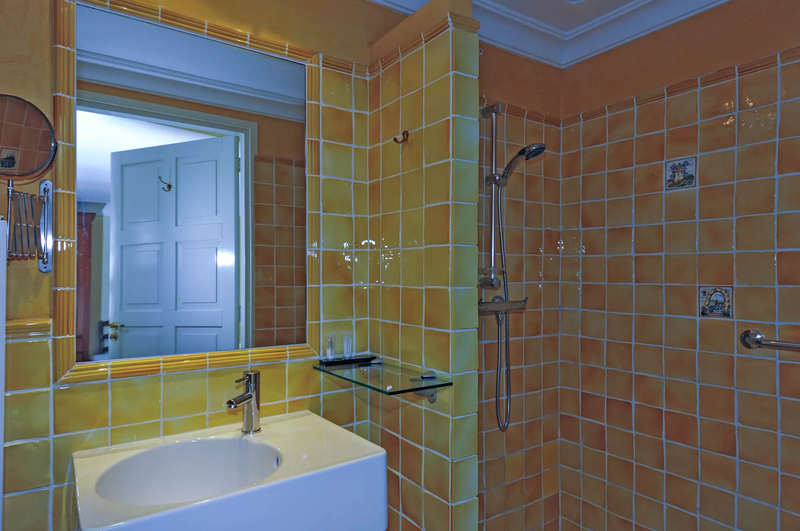 Cannes, with its attractive old town, good choice of restaurants, shops and galleries, is only a short drive away, and this villa is particularly convenient for the Film Festival every May. 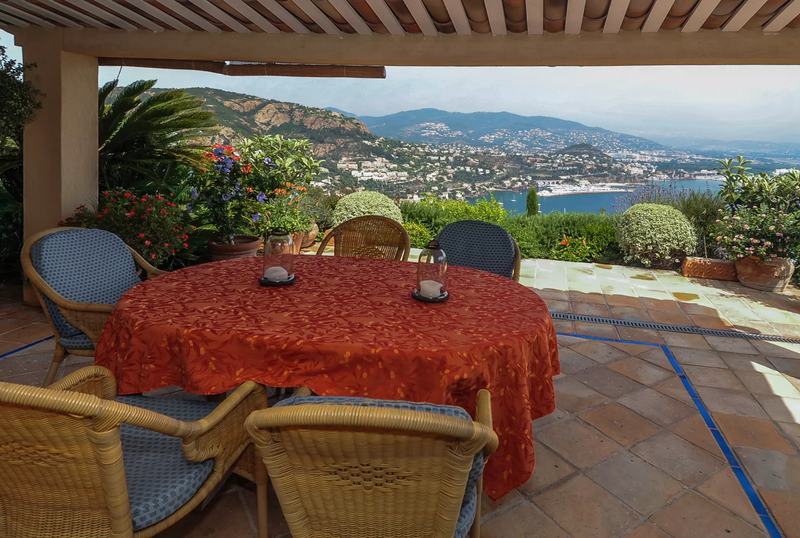 In the fishing village of Théoule-sur-Mer, less than two miles from your vacation villa, you will find shops, a weekly market and good local restaurants: a perfect way to enjoy your holiday on the Cote d’Azur. 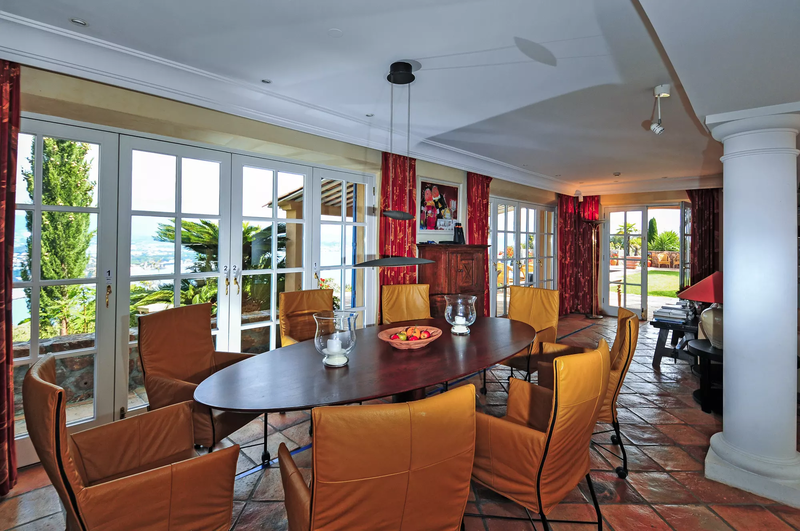 Large open plan living/ dining area, (TV, DVD, music centre), gas fireplace (which can be used on request), 4 French doors to covered terrace and garden, outdoor dining facilities. 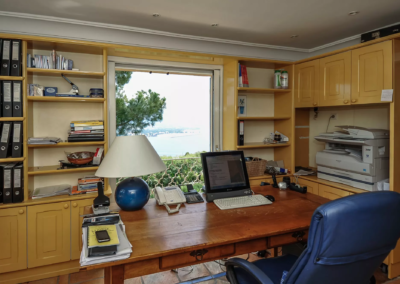 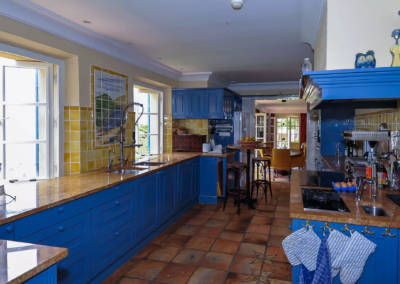 Fully equippedprofessional kitchen, sea views. 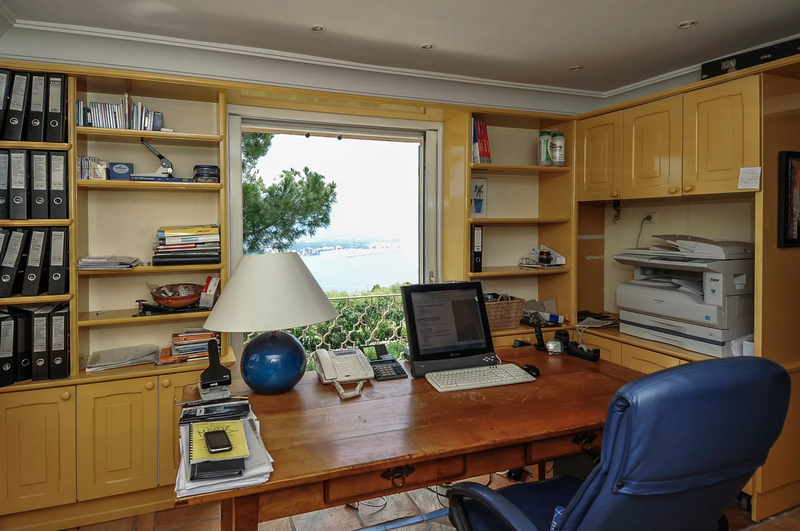 Study, (desk, WiFi connection/ music centre), air conditioning. 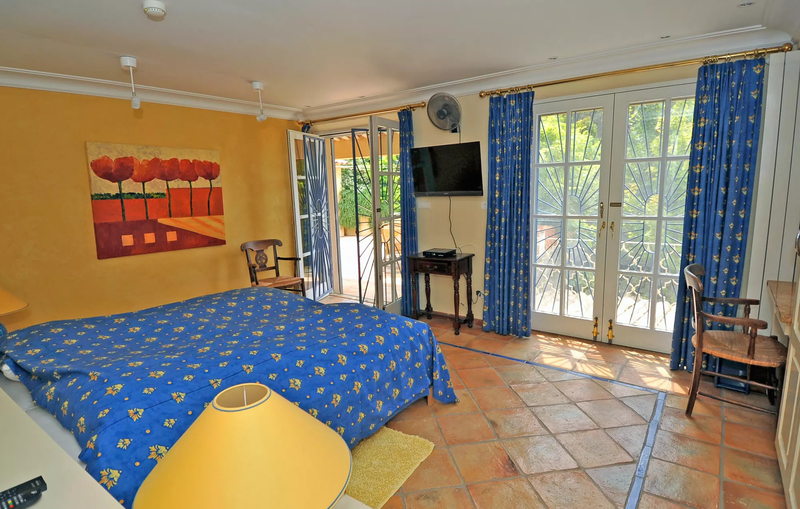 Master bedroom (2m x 2m), (air conditioning, safe deposit box, TV), French door to private patio. 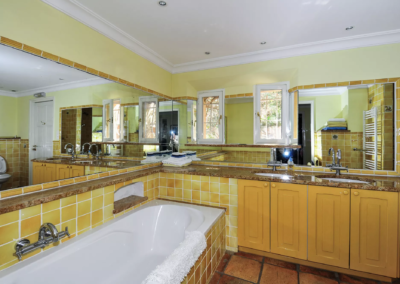 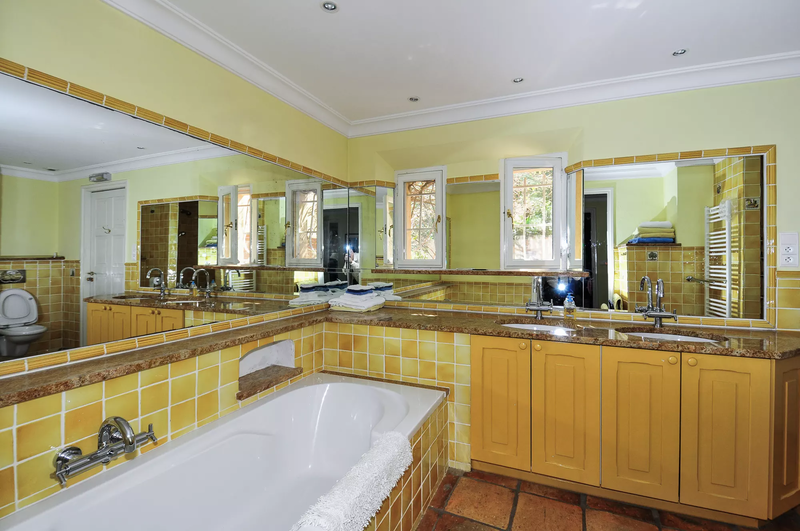 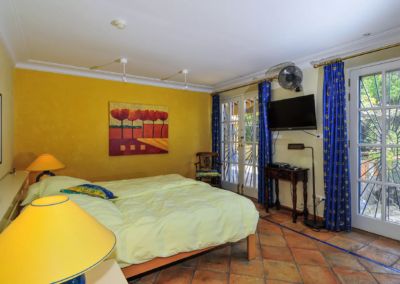 Double/twin bedroom (2 x 90cm), safe deposit box, French door to garden, en suite shower room, WC. 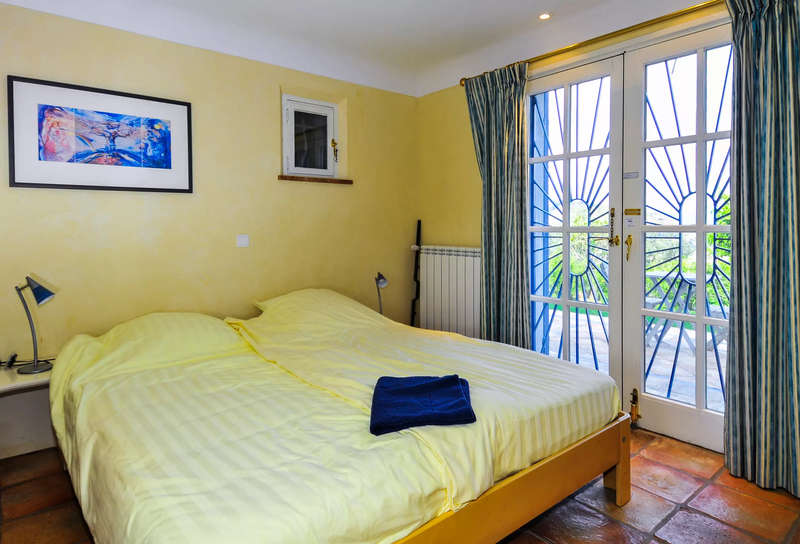 Double bedroom (1.80cm), French door to garden, en suite shower room, WC. 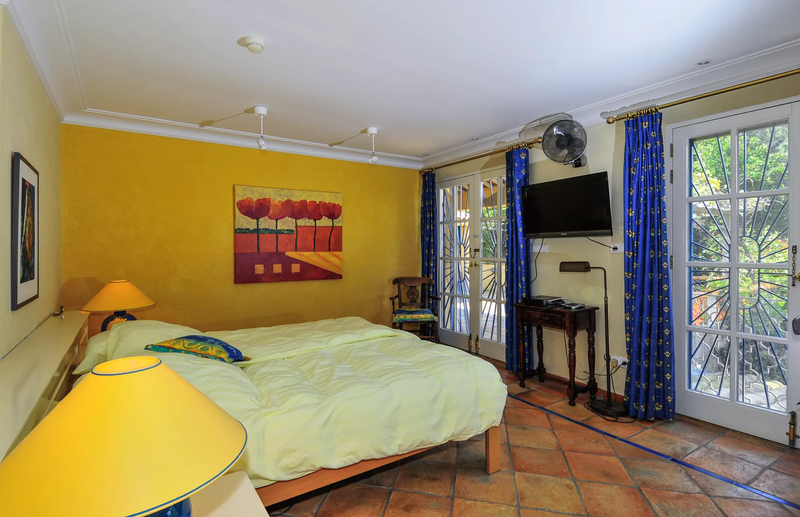 Family suite comprising 2 areas: bedroom/ playroom (2 pull out beds, TV, videogames), double/twin bedroom (2 x 90cm), (TV), French doors to patio. 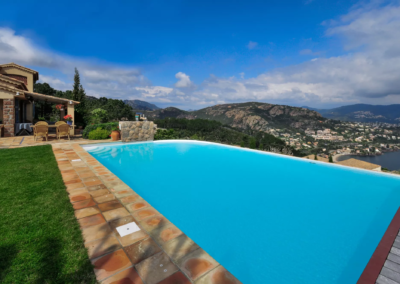 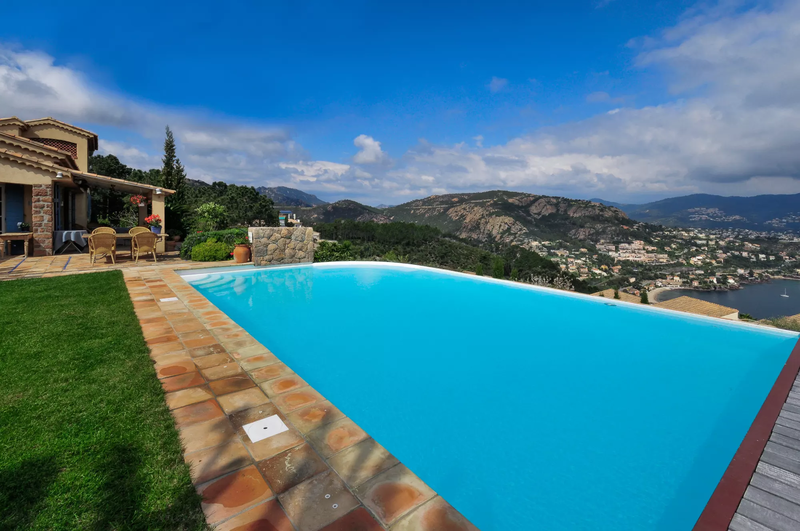 The breathtaking mountain views and the unique pool location, that seems to be merging with the sea beyond.